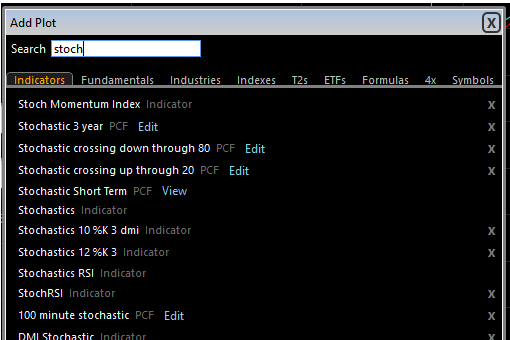 To jump to a particular stock, just start typing the symbol or the company name and the list will filter automatically. To add a plot (like an indicator) to the chart, press the forward slash / key then start typing the name of the indicator. Chart time frame - you can scroll through time frame settings by holding down CTRL and using the mouse scroll wheel. You can go directly to a time frame using the hot key list below. Load chart template F1 - F9, F11 and F12 (F10 is reserved in Microsoft Silverlight and cannot be used). You can edit the templates that the F keys are assigned to by clicking the Chart tab and setting the F keys on individual templates. *Note: If you're on a Mac, you have to hold down the 'fn' key while press the F key.